Click here to watch how it works! 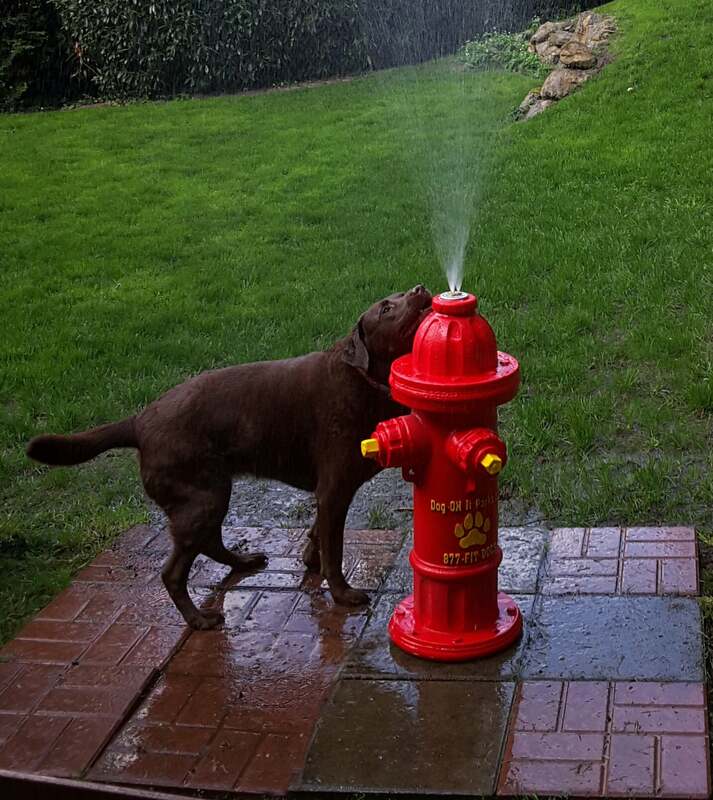 No need to spend tens of thousands of dollars on a splash pad, our Top Spray Hydrant is a cost effective way to provide a unique water feature. With a light mist to refresh (but not drench!) 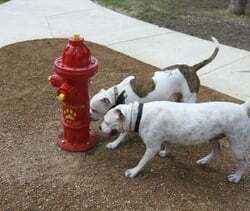 your pooch, the Dog-ON-It-Parks Top Spray Fire Hydrant is sure to be the coolest spot in the dog park! Just push the button on the top of the activator hydrant to initiate the spray feature. The special valve will dispense a three to four-foot high shower of water before automatically shutting off. Easily adjust the timer to spray from 10 to 60 seconds. 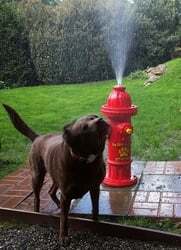 No need to worry about wasting a lot of water - the solid brass spray mechanism uses less than two gallons of water per minute. 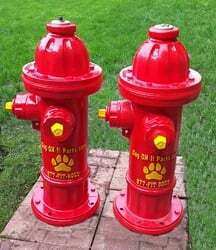 Our Spray Fire Hydrant is cast from an authentic hydrant using a high-strength fiberglass resin, so it looks real but will never rust. Note: Regions with hard water - we strongly recommend purchasing an inline water filter to help prevent mineral deposits that can cause build up. Hydrant is 34″ high, with a 12" diameter base. All internal components are made from stainless steel, brass or composite materials for long life and low maintenance. Valve mechanism comes completely plumbed for easy installation, including shut-off/drain valve, pressure reducer and back-flow preventer. Generous 20-foot supply line from activator to spray hydrant. Base is factory drilled to accept (4) stainless-steel anchor bolts, up to ½-inch diameter. Anchor bolts not included due to the variety of installation options. IMPORTANT: This system is not frost resistant and must be shut down and drained seasonally to prevent damage from freezing.